How can you make a difference? It's easy - by donating your time while visiting a destination in need of your help. It's been dubbed "voluntourism," and it's sweeping the nation. "Imagine the face of a lion cub looking up at you waiting to be fed at a reserve in South Africa"
According to the Travel Industry Association, 25 percent of travelers say they're currently interested in taking a volunteer or service-based vacation. Whether its students spending spring break in a third world country, or families traveling just one state over, there are options and opportunities for people of all ages and walks of life to make a difference. With this increased interest in voluntourism, it's important that travelers know how to pick the right volunteer opportunity for them. Before jumping into helping others, help yourself by asking the following questions recommended by i-to-i, a meaningful travel provider - Click here for all tips. From traditional holiday parades and festivals to the migration of California gray whales along the Pacific coast, a visit to San Diego during the winter offers a wealth of free, fun and festive experiences. Visitors to the region can escape overcast skies and the wintry cold for San Diego's brilliant sunshine and temperate climate and enjoy diverse wintertime experiences. The following suggestions for free activities and events are sure to capture the imagination and lift the spirits of visitors to San Diego during the upcoming winter months. Join the festivities during Balboa Park December Nights, a two-day holiday celebration of food, entertainment and fun on December 2 - 3. The numerous museums and cultural institutions in Balboa Park, the nation's largest urban cultural park, open their doors free of charge, and festivities include carolers, live music, holiday light displays, theater and dance performances and delicious foods from around the world. Witness a tradition that began as a gift to the children of San Diego in 1947 - the Annual Mother Goose Parade on November 20 in the East County city of El Cajon. One of the biggest parades of its kind in the country and the largest single-day event in San Diego County, the parade features floats, clowns, Santa Claus, marching bands, equestrian teams and celebrity appearances. Whale watch from the shores and cliffs of Point Loma, as California gray whales migrate south to the warm water breeding grounds off the coast of Baja, California. Spectators can catch a spectacular show during December through April when these majestic mammals pass through the waters off San Diego's coastline. Be part of a grand Holiday Celebration on December 2 in Coronado with a festive parade along Orange Avenue, the lighting of a 75-foot Christmas tree, holiday music and a firework show over Glorietta Bay. To read more story ideas from the Vancouver Island region, visit www.hellobc.com/vancouverislandmedia. Vancouver, Coast & Mountains: Glaciers, Mountains and Airplanes, Oh My! Sometimes a bird’s eye view offers the very best vantage point. Not to mention a total adrenalin rush. With Squamish’s Glacier Air, you get both, thanks to flightseeing tours that buckle in for high-flying glimpses of glaciers, mountains and forests between Vancouver and Whistler. You could, for example, spend 25 exhilarating minutes high above the Squamish Valley, with unobstructed views of the rainforests, ice falls and glaciers that make up the Tantalus Mountain Range. There’s a 40-minute panoramic tour into Garibaldi Provincial Park — one of BC’s largest — complete with unforgettable glimpses of the mighty Black Tusk and the Mamquam Icefield. To cool the jets, the 50-minute “Olympic” tour of the mountain town of Whistler is a tad bit more sedate, with views of a natural volcanic dam, Cloudburst Mountain, and glimpses of the ski runs on Whistler and Blackcomb mountains that garnered so much gold during the 2010 Olympic and Paralympic Winter Games. No matter your choice, you’re in good hands with the pros at Glacier Air; with over 25 years of in-flight experience, these pilots will surely demonstrate that the sky is the limit. www.glacierair.com. To read more story ideas from the Vancouver, Coast & Mountains region, visit www.hellobc.com/vcmbcmedia. For more places to go and things to do in British Columbia, click here. If the little devil in you still prefers “tricks” over treats and goose bumps are your gauge of a good time, members of National Trust Historic Hotels of America can offer a ghastly good time. Spanning over 300 years of history, these hotels have seen their share of unrequited love, untimely deaths and unsolved mysteries—all ingredients that stir supernatural specters. Make your Halloween a truly haunting experience with a visit to one of these spooktacular sites. Choose to go ghost hunting with a group, participate in a murder mystery weekend or book a stay in a “preoccupied” room. The Holly Hotel been referred to as the most haunted historic building in Michigan, and perhaps the most haunted in America. 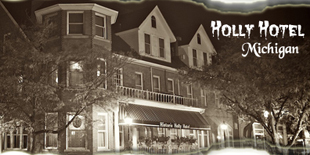 By all accounts, the Holly Hotel does seem to be one of the few active haunted hotels where the occurrences continue over and over. The haunting and strange happenings have been observed by many people, from employees to guests. Very few of these can be easily discounted. The ghostly residents seem to follow certain “habits,” and even if one is ignorant to the fact that the restaurant is haunted, their experience will often fit into a known set of occurrences. For example, many people have smelled cigar smoke, even though they didn't know that original owner of the Inn smoked cigars. The descriptions of flowery perfume is often strikingly similar as well, and for some reason, the meat cleaver is the favorite toy for a little girls’ spirit who still plays in the kitchen and on the banquet room steps. Some people avoid “haunted” hotels and lodges. Others flock to them. Those in the latter category will find esoteric thrills galore at the Punderson Manor State Park Lodge in northeast Ohio’s Punderson State Park. And it doesn’t have to be Halloween, or even a dark and stormy night, to bring on the action. Some employees have heard the sound of children’s laughter when there are no children around. Fires go out. Pencils fly across a room. Doors open and shut of their own volition. Faucets turn off and on with no one near. Televisions turn on by themselves – or off. Usually at inconvenient times. It’s enough to make a housekeeper cry, “Stop!” and sometimes these strange occurrences do. For example, guests sometimes hear loud noises coming from rooms next to them, which are in fact unoccupied or, in one case, from the room above (except that guest was on the top floor). Most of these happenings are just annoying – or entertaining, depending on how open the guest is to experiencing such strange events. But at least one event was pretty grisly: The specter of a lumberjack was seen hanging from a beam in the lounge for nearly three hours. Many staff members saw it. This was the only really scary event of dozens reported since the elegant 31-room manor opened in northern Ohio in the 1950s.